Yesterday’s Google I/O talked a lot about Android Wear. We saw Moto 360, Samsung Gear Live and LG G Watch. Android Wear is designed to work with Android phones running 4.3 or higher. 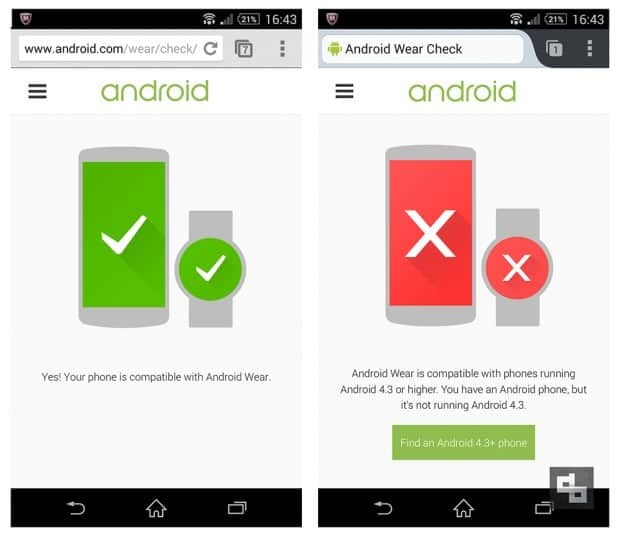 If you want to check whether your smartphone is compatible with Android Wear or not, you can just visit g.co/WearCheck on your phone. The link will redirect to http://www.android.com/wear/check/. Compatible With Android Wear Or Not? If you look at the two screenshots below, you can see what kind of status you might get. I opened this link on my smartphone (Sony Xperia Z1) and found two different results on two browsers. On Firefox, it showed not compatible and in Chrome, it showed Compatible. Strange. But after restarting the phone, the status was correct on both the browsers – it was compatible.